Last week I spent two mornings at what may be the last ever Dublin Web Summit. 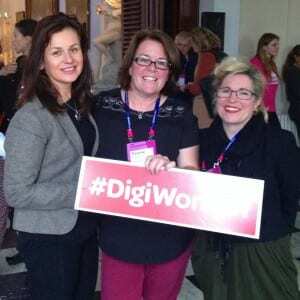 I was gifted a ticket by Pauline Sargent for my work on DigiWomen. I didn’t know I was going until last week so I didn’t have or need to have a specific objective to fulfil while there. Last year when we were there Pauline and I, with our DigiWomen hats on, had a very specific agenda around raising awareness about gender balance at tech conferences. As we were working the floor, getting as many responses as possible to our survey we suffered terribly from FOMO (Fear of Missing Out). This year we didn’t have a particular objective, although Pauline had some “responsibilities” as a Pub Crawl host, so we were able to just enjoy the spectacle. And it is spectacular. The stage sets are eyecatching, the volume of beards and dark glasses is at times overwhelming, the variety of companies with brilliant, unusual, bonkers products and services is mind-boggling. While the Web Summit might not attract quite the same crowds as next week’s Knitting and Stitching Show at the same venue the numbers are impressive. There is so much to see, so many presentations taking place concurrently, that anyone who attends will tell you that it is impossible to access even half the Summit. Therefore I focussed on my area of interest (dubbed marketing, society and content (or so I thought) and got along to as many as I could fit in in the two mornings available to me. Here follows some of my key takeaways and comments from Tuesday and Wednesday mornings. I kicked off each morning with a wander around the exhibition stands. The stand out service for me on Day 1 was MakeItApp.eu which is a platform for collaboration and promotion of apps. I had a very brief chat with one of the team but I could see a lot of potential here for new and seasoned app developers looking for projects as well as artists of all kinds and project managers. With my DigiWomen hat on I sauntered over to the Society stage to hear Emily O’Reilly, European Ombudsman and I managed to catch the end of the “fireside chat” between Kevin O’Malley, US Ambassador to Ireland and Dearbhail McDonald from Independent News and Media. He was speaking about the US Embassy’s Creative Minds programme and this was the first of a number of talks I would catch on Tuesday that put an emphasis on creativity. I then caught a very interesting panel with Mike Krieger from Instagram (who may have suffered because of my exposure to Instagram the previous week at DigiWomen’s Be Better At… Facebook for Business event) and Anna Dickson, Photo Lead at Google who I think was among my favourite speakers at the Summit. The talk was entitled “The Power of the Pixel”. Readers of this blog knows I’m a die hard Instagram fan but I was entranced by Anna’s engaging and intelligent responses. She came to Google from, among other places, Huffington Post, where they realised early on that “stories [could be]built from visuals” This should be borne in mind no matter what your work. If you are responsible for creating content, it is key to think visually when planning your posts. Read my post on DigiWomen for a few great tips on how to capture a good photo to use across your networks. One of the reasons Anna accounts for the rise of the era of the photo is because visuals are a universal language. Mike shared an interesting statistic that 75% of Instagram users are outside the US. Anna also commented, when talking about her top tip for online photography, that “the best camera is the one you have with you” so make the most of those pixel rich phone cameras to “tell the story” When asked what the next big thing will be in online photography Mike half-jokingly said the 360 VR OR Selfie (VR= Virtual Reality, OR= Oculus Rift). He chortled but I swear I saw this in action at Web Summit. Of course I can’t for the life of me remember the name of the company who are doing it… Anna said that search needs to be improved on images: all hail to that plan! I lashed into the Centre Stage briefly to catch Mike Schroepfer from Facebook talking about Connecting the World where he outlined some of Facebook plans to make the internet accessible even in the most inaccessible places using lasers. And like Anna Dickson’s prediction for the future of photography lying in better search there is emphasis in Facebook on developing machine reading of images. For every $1 spent on email marketing there is a return of $44. Email marketing has been measured as being 40 times more effective than social for conversions. No I don’t have a source beyond Alex Bard’s interview at Web Summit – sorry. Why would he make it up….? While I managed to miss all of the talks Slack were involved in I heard via Alex Bard’s interviewer, Steve Dempsey, that Stewart Butterfield, Slack CEO, had called email “the cockroach of the internet” on the main stage earlier that day. I’m a big fan of both email and slack for very different reasons. If you ever work on a project with me, chances are we’ll be using Slack! That was my first morning done so I hopped on my bike to my other job to return fresh the next morning. Pinterest is not a social network; it’s a life planner and a discovery tool. Actions taken are discover, save, do which match marketers’ objectives to drive awareness, consideration and conversion. Therefore it is a great fit to allow marketers to fulfil those objectives. It is objective based advertising and therefore more measurable. Mendelsohn shared the fact that there are 4 billion video views a day on Facebook meaning it’s a viable platform for your video. A panel with David Rusenko from Weebly and Mollie Spilman from Criteo advised us to embrace mobile because 50% of all traffic happens on mobile and 35% of all transactions. I’m sure I mentioned that at least 6 months ago. Following that I attended an inspiring talk entitled “The Ultimate Selfie: what we leave behind in a digital world” by Jacki Ford Morie which considered the prospect of creating avatars that could learn and that could develop empathy and go on to outlive us. This was followed by an energising (all female!!) panel discussion on the topic of “Is Humanity a digial construction? On an emotive techspace.” which expanded and explored some of Ford Morie’s ideas. I was particulary taken with Nell Watson and Andra Keay. However, most of the lightbulbs that were switched on there will illuminate my future science fiction novel. At the rate I’m working on it, my avatar will be finishing it long after I’ve passed. Lastly, about food. No I’m not going to whinge about the Food Summit. I’ve never even seen the Food Summit because lunch is for losers or people who don’t have time like me. I always pack a few high energy bits and bobs and drink too much coffee at Web Summit. However this year Pauline and I had the good luck to bump into Shane Ryan of www.eatfeed.ie who shared little sample pots of his delicious superfood salads with us. This was definitely the service of the day for me: you can order a superfood salad for €5.50 from his website and for every “feed” ordered they donate a meal to one of the world’s poorest children. Currently they only deliver to Dublin 1 (on their delivery bike, pictured!) but I really hope they will eventually slog up the canal to us!